Photo courtesy of Lindsay Pennington Inc.
Gorgeous, welcoming, and tranquil bedrooms: you pin and re-pin them on Pinterest, sigh over them on interior design websites, and drool over their images in glossy home décor magazines. But if you are like many people, you shrug off the idea that you could have a bedroom just as beautiful, just as peaceful, just as cozy, and most importantly, just as much the room of your dreams. And you can do it without spending a fortune. In fact, with the great advice from top interior decorator Lindsay Pennington, you can do it yourself, whatever your budget and whatever your favorite decorating style. Read on for Lindsay’s five steps for a top-to-toe bedroom makeover that can be completed in a weekend. Blue and white is a classic bedroom color combo. Photo courtesy of Lindsay Pennington Inc.
A partial canopy creates romance without taking up space. Photo courtesy of Lindsay Pennington Inc.
A home makeover is like a road trip in that without a map or clear directions, you might not ever reach your destination. In step two, you’ll reconfigure your bedroom furnishings to match the vision in your mind. Start with basic questions: Does your furniture really suit your tastes and needs? Is your bed large enough (or is it too big)? Does your bedroom “work”? The answers to these questions give you a guide for creating your dream bedroom. Once you are clear on the basics, take another look around your room. Now’s the time to get more detailed; ask yourself if the furniture is positioned properly and accessories are shown to their best advantage. According to Lindsay, it all starts with your bed: a simple rule of thumb is to place your bed on the longest wall in the room, and then place your remaining pieces of furniture in the most complementary position around it. The walls here are painted "Quatrefoil" from Ralph Lauren Home paint. Photo courtesy of Lindsay Pennington Inc. If you're willing to put in a little elbow grease, you can paint the room yourself in one weekend, and spend as little as $20 per gallon of paint (according to Lindsay, the average size bedroom needs two gallons for adequate coverage.) Lindsay is especially enthusiastic about the Ralph Lauren Home paint selection carried at Home Depot. For the best results, however, don’t skimp on your paintbrushes or rollers – good quality brushes provide smooth, full coverage without streaks or shed bristles. But don’t stop at the walls – there are many other ways to liven up your bedroom with paint. Lindsay often paints ceilings, trim, beat-up furniture, and even floors. While it does takes a little more time and patience to wield a paintbrush on surfaces other than walls, the payoff comes at the end, when you have an entirely custom-colored bedroom. Lindsay adds, “If you're a renter, you can still color your walls.” Look for removable wallpaper that can be painted your favorite color, and then easily stripped without damage to the underlying wall once it’s time to move. 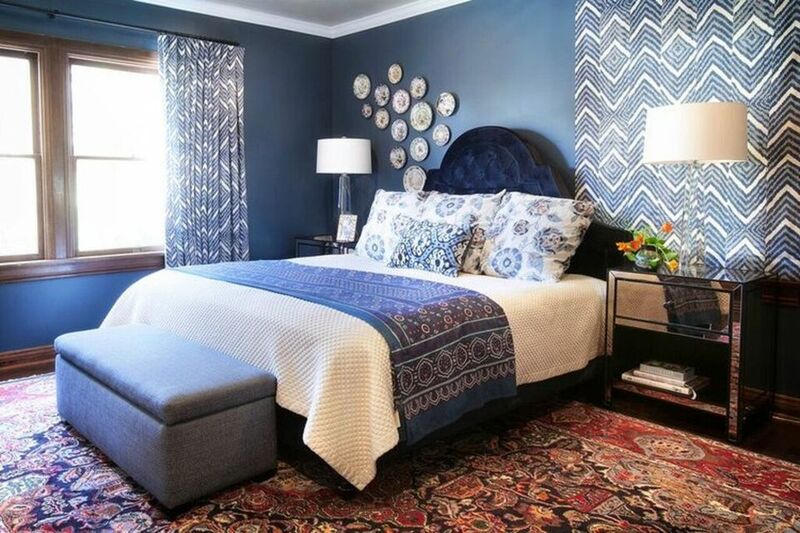 Create an accent wall with drapes. . Photo courtesy of Lindsay Pennington Inc.
Now that you have your bedroom’s game plan, and it’s painted in your favorite color, it’s time to look at your bed – the star of your bedroom. One of the fastest and easiest ways to give your private retreat an entirely new look is by updating your bedding. 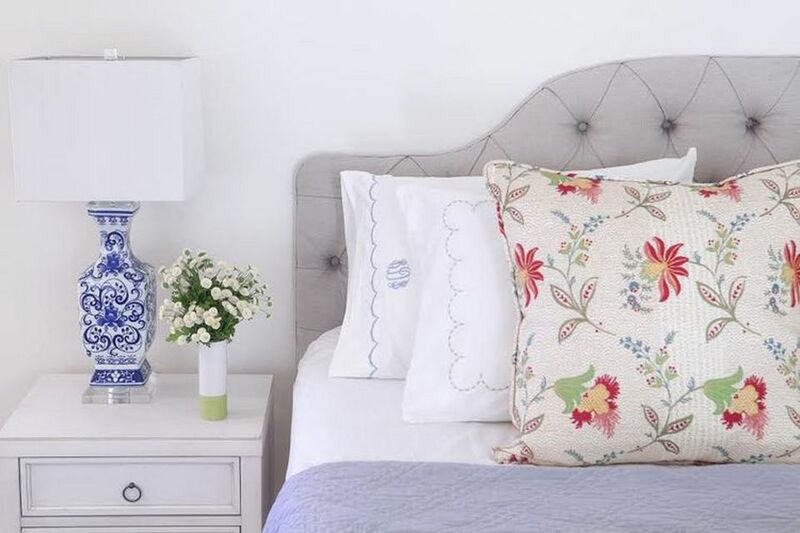 And no, it doesn’t have to cost a fortune; you can find wonderful bedding ensembles at a discount at shops like HomeGoods, or even at Target or Walmart. When it comes to choosing your bedding, Lindsay likes to keep it simple: “New white bedding instantly makes a room feel updated, clean, and elegant.” She then layers accent pillows and shams, along with an extra blanket or quilt, on top of the white bedding to give a sense of coziness to the space, and add a touch of pattern and color. Dark walls create a peaceful mood in the bedroom. Photo courtesy of Lindsay Pennington Inc. Even a small bedroom has a spot for a comfy chair – if you don’t already have one, check out thrift stores for good deals -- for reading or pulling on shoes in the morning. Even if the chair needs new upholstery, you won’t need much fabric and can often transform an old, ugly chair into a showstopper for less than $200.